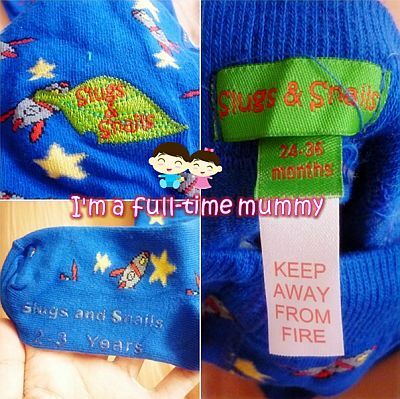 "Slugs & Snails tights are more than just tights. Our designs (unlike girl’s tights) don’t stop at the knee, which means that they can be worn with or without trousers. Each pair comes with our unique Slugs & Snails© leaf logo and anti-slip soles to give grip to busy little feet. * No more lost or odd socks. * Warm legs and snugly toes. * Soft breathable combed cotton. * Soft non-slip text on the soles, ideal for wooden or ceramic floors. * Funky designs loved by little ones. * Beautiful packaging ideal for gifts and baby showers. All our tights are 80% Cotton (17% Polyamide, 3% Elastane – the stretchy thingies) and made by our lovely manufacturers in Turkey. No Slugs or Snails are harmed in the making of our products." This product arrived in 2 weeks time somewhere in the middle of April and it took me about 1 month before I can get down to reviewing it on my 3 year old. The reason in the delay is I waited until our recent family trip before I can try it out on Benjamin. The tights came in a neat package with a little transparent window for you to peek into the designs. 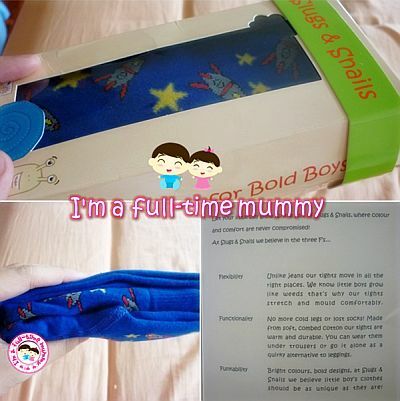 It is folded nicely and you can read about their 3 Fs philosophy at the back of the box. I requested for the "Out of this World" design with the biggest size they have which is 2-3 years old since Ben is 38 months old now. I love the anti-slip soles which actually reads the brand name and the tights size. The sewing is nicely done and I really love the funky design and the vibrant colors! Btw, Slugs & Snails are a great potty training handbag/nappy bag accessory too as they take up no space and are super handy to keep tucked away in case of any little accidents because you have a pair of trousers and socks ready to wear with no fuss! Cool feature! I love the fact that the tights kept him warm and yet did not restrict his movements at all, and at the same time making him look as cute as ever with its funky designs! And honestly speaking, I think my girl would look cute wearing one of this too! I am so excited to be able to hold this giveaway for my lucky blog followers and readers! 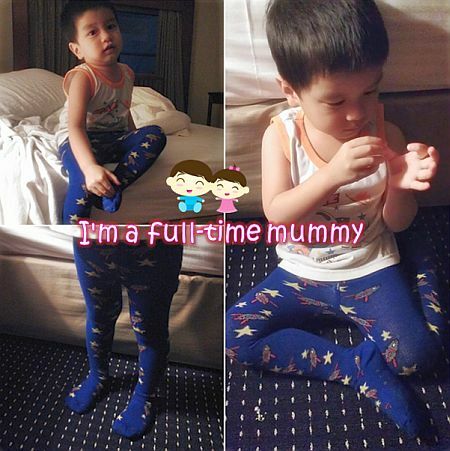 ONE of you lucky people are going to win a pair of this funky tights for your child! Now, let's read below for the giveaway terms and conditions OK? To enter the giveaway, kindly read and follow the instructions as stated in the Rafflecopter form below. You can enter either via login through your Facebook account or just key in your name and your valid email address. Please also leave your valid email address in the post comment so that I can contact you if you win this giveaway. I received no monetary compensation for this review, I was provided with the product by Slugs & Snails in order to facilitate my review. All opinions expressed in this post are my own. Please do your own research when purchasing products, as your opinions may differ from mine. I'm entering for the giveaway. Winner selected! Entry #171Janice L. please reply my email in 48 hours! Congrats and thanks to the rest for entering! All work by I'm a full-time mummy is licensed under a Creative Commons Attribution-NonCommercial-NoDerivs 3.0 Unported License.